MIAMI, Florida -- NOAA's National Hurricane Center storm tracker in Miami, Florida has issued a Tropical Weather Outlook at 8 a.m. EDT on October 21, 2014 which predicts a medium (50%) chance of an area of low pressure becoming a tropical cyclone during the next five days. Satellite images and surface observations indicate that the area of low pressure in the southern Bay of Campeche has become better defined. Although the associated showers and thunderstorms are currently not well organized, NOAA says that this system has the potential to become a tropical cyclone during the next day or so while it moves slowly eastward toward the western Yucatan Peninsula. Later in the week, the low is forecast to interact and possibly merge with a frontal system over the southeastern Gulf of Mexico or northwestern Caribbean Sea. An Air Force Reserve reconnaissance aircraft is scheduled to investigate the disturbance this afternoon, if necessary. 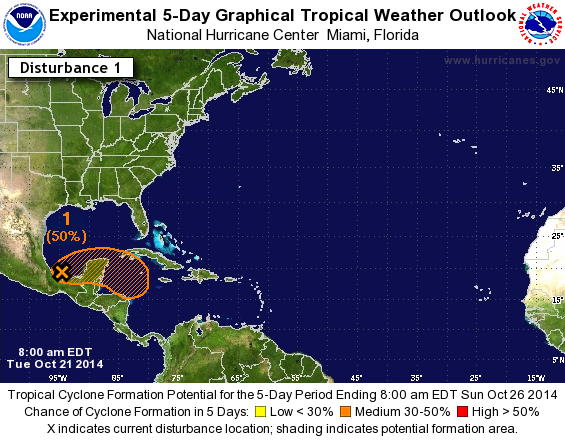 Interests in the Yucatan Peninsula should monitor the progress of this system. Some spaghetti models forecast that this system, named Invest 93L, will move over or near South Florida and/or east Central Florida later in the week.